The way Philadelphia Union opened its off-season, it looks like Ernst Tanner was just itching to get started. The club was one of the first in MLS to announce its off-season contract decisions. Tanner was active during the half-day trade window, trading Fabian Herbers to Chicago. Most significantly, the Union made a key off-season foreign signing earlier than they ever have, securing the rights to Brazilian striker Sergio Santos. The early takeaways are a mixed bag, but the Santos signing is definitely a statement move. Here’s why. Santos doesn’t have an extensively impressive track record as a professional, but that’s likely why the Union could acquire him at the reported rate that they did. 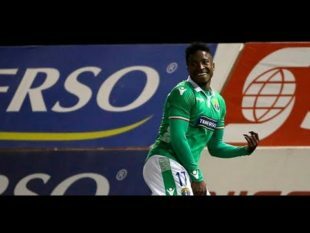 The 24-year-old Brazilian from Belo Horizonte just had his breakthrough, netting 9 goals in 15 games this season for mid-table Chilean side Audax Italiano. This was the season he moved pretty much full-time to center forward, and he produced. Before that, Santos bounced between that role and both wings, as a left-footed attacker with ability to take on defenders one on one. Santos left for Chile at age 19 after failing to break through with his youth club, América Mineiro. They’re the smallest of Belo Horizonte’s three clubs, yo-yoing between Brazil’s first and second divisions. while rivals Atletico Mineiro and Cruzeiro are traditionally among the first division’s best clubs. Significantly, América previously employed former Union midfielder Fred, who is also from the Brazilian state of Minas Gerais. The point is that the Union have secured Santos’s rights before his value increases significantly. At the same time, they have taken a risk by dropping a reported $500,000 transfer fee — which is about what Transfermarkt values him at — on a player without an extended track record of production. This is how it’s supposed to work though. Buy low, sell high. If Santos has been sufficiently scouted, then it’s a risk worth taking. The Union are acquiring Santos with the hopes of getting probably two good seasons from him, putting him in a shop window for Europe, and selling him at a profit. Thank Atlanta and Miguel Almiron, Union fans. Santos reportedly chose Philadelphia over Mexican side Nexaca. MLS now offers a nice stage for Europe. This year, the Union got off to an awful start that cost them dearly come playoff time, and it was in large part due to Borek Dockal arriving just before opening day. He was neither fit nor acclimated with his teammates. That’s been a repeated problem for the Union over the years: Bringing in key acquisitions too late and then struggling at the outset. That notably happened in 2014 as well. By signing Santos now, it gets him into town and camp on time. He can get settled with a new home. He can start getting to know the technical staff. And he’s there on day one of preseason training. The fact that the Union got anything for Herbers is a bonus. He easily could have departed in the Re-Entry Draft for nothing. So credit Tanner for making that deal. On the other hand, the Union let Marcus Epps go to waivers, and the New York Red Bulls traded to get him — but they gave their asset to San Jose. San Jose merely had to give up their spot in the waiver draft, which they likely weren’t going to use, to get a second round draft pick. Philadelphia could have gotten that pick had they traded Epps themselves. That’s a wasted asset and missed opportunity. Epps already looked like the player the Union were making the biggest mistake in releasing this off-season. The Red Bulls seem to agree. MLS teams are rarely active in the waiver draft, with usually no more than three or four players selected, and you never see a trade made in the draft. Ernst Tanner has wasted no time in putting his stamp on the Union’s roster. That’s a good thing, because there’s an impatient fan base that has no time for that. The Union have the core elements of a very good team, but we’ve said that before. They’ve added a quality striker. The biggest task now is finding a creative playmaker to replace Borek Dockal. What I really like is what others have already pointed to, Tanner’s honesty and relative openness combined with the early moves. Accepting where this team is at with ownership and spending, this is the type of Sporting Director I was hoping for. Someone who will scout everywhere and anywhere and be proactive while being honest and forthright with the fans. He seems to want to promote the youth if the rumors about Aaronson are true. I must say I find myself quite pleased. As CPfeif says, … ?!! That Tanner quickly expects him to surpass Fontana on the depth chart. Which in turn I would expect to mean playing time or more practice time with the club. I’m not breaking any news here so I don’t know why you both reacted the way you did. Got ya. I remember reading that. In the context of your comment I just thought I missed something else. Though I’m not sure I see that as coming from Tanner as much as the whole organization. Aaronson was signed directly to the first team by Earine not Tanner and they have featured him a bunch in hype videos and stuff so it seems to me like they all rate him pretty high and expect him to rise quickly and be one of the faces of the franchise. There’s a lot of holes in this roster. They aren’t all going to be filled by new signings or the draft. What I hope, and think, is that players like Aaronson, Ngalina, and such will play bigger roles with the first team. By that I mean spot starts in Open Cup, or limited exposure while gaining experience. Under Stewart I would have assumed these things maybe a year or more off. Whats the deal with attacking mid Adam Maher? He has been mentioned here once or twice. Was valued at over $8m 3 years ago but now only $1.5 and only 25yrs old. Did he have injury or attitude problems? I don’t follow the Dutch league closely, but the numbers indicate he hasn’t performed well since a $7m transfer five years ago. Eindhoven let him go on a free after that, from what I can tell. Really pleased with the moves so far. If Epps hurts us on game day then thats a bit of a bummer. Hey Dan I have been to that VW bus to get a 700 bucket hat. From Mr.Farnsworth. He wouldn’t accept my payment. Thanks for the pic. Brought back a great memory. Also, Happy Holidays to you and your family! Loyal PSP reader from 2010!